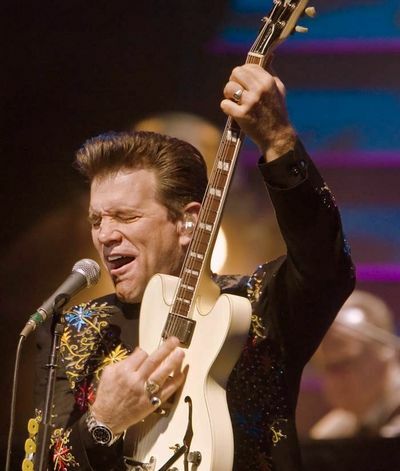 Chris Isaak has made a career working of the blueprint established by Elvis Presley. The debt is apparent in Isaak’s music, hairstyle and demeanor, a cool, effortless charm to the humor and charisma that plays equally well in both music and acting. So it’s only natural, then, that Isaak pay homage to Sun Records, the label that launched Presley. Friday’s 90-minute show before a packed Uptown Theater paid homage to Sun and underlined its connection to Isaak’s own 26-year- old catalog. “Don’t Leave Me On My Own” sounded like a cross between “Wooden Heart” and “Are You Lonesome Tonight”; “Let Me Down Easy” could have been a lost Presley single. During “American Boy” Isaak raised his arms and shook his hips with a vigor that would have landed him in trouble on the Ed Sullivan Show. After driving through some of his favorite originals -– including a stretched-out “Baby Did A Bad Bad Thing” and reliably hypnotic “Wicked Games” -– Isaak devoted the second half of the night to Sun. The arrangements stayed faithful to the original recordings, but the crowd’s energetic response showed there is still a hunger for this material. It takes courage to cover songs as beloved and well-known as “Ring of Fire” and “Great Balls of Fire.” Isaak pulled it off, in part because those songs are right in his wheelhouse anyway, but also because of his obvious respect for, and love of, the material. The upbeat numbers also gave guitarist Hershel Yatovitz plenty of space to unleash several of his rowdiest solos. Isaak performed most of the main set wearing a sparkly, sequined ensemble that looked like a Nudie suit designed by Lady Gaga. He poked fun of the outfit several times during the night and emerged for the encore in an even more outrageous mirror ball suit. The tone was warm and casual. Both Isaak and Yatovitz ventured into the crowd. After winding through the main level during “Don’t Leave Me On My Own,” (with frequent stops for pictures) Isaak delivered “Love Me Tender” from the front of the balcony. Later, Isaak introduced pianist Scott Plunkett as the type of musician children could look up to. After the applause died, Parker promptly produced a large bottle from his piano and took a long swig. Fans still shuffling to their seats three songs into the set probably regretted their truancy. Although Isaak performed a generous two-dozen songs, most of the songs delivered could have fit comfortably on the A-side of a 45. Isaak ended the night with a gorgeous solo acoustic version of “Forever Blue.” The ending seemed premature, but at the same time it didn’t feel like he’d left anything out. Setlist: Beautiful Homes, Dancin’, Somebody’s Crying, Don’t Leave Me On My Own, Love Me Tender, I Want Your Love, San Francisco Days, Wicked Games, Speak of the Devil, Let Me Down Easy, Go Walking Down There > American Boy, Baby Did a Bad Bad Thing, My Happiness > Ring of Fire, Dixie Fried, How’s the World Treating You?, Live It Up, Miss Pearl, Great Balls of Fire. Encore: Blue Hotel, Big Wide Wonderful World, Can’t Help Falling In Love, (Oh) Pretty Woman, Forever Blue. Producers had been looking for a “white singer with a black sound” long before Sam Phillips signed Elvis Presley. But Berry Gordy’s quest definitely added a layer of irony to the process. Not that Gordy fared any better than the majority of his contemporaries. We can be fairly certain that the assets that drew Gordy to Chris Clark were not vocal. Nonetheless, Gordy positioned Clark to be Motown – and America’s – answer to Dusty Springfield. He propped her up with songs by Holland-Dozier-Holland and even wrote and produced several numbers himself. Gordy’s favoritism didn’t go over so well at Hitsville. Other artists resented that Gordy spent so much time trying to make a star out of someone who refused to wear shoes, didn’t dress sharply and ate too much. The public didn’t find much to like, either. Clark’s releases refused to dent the charts. “Love’s Gone Bad,” a HDH composition, was her greatest success, and somehow was enough to earn her the right to cut a full album the next year. 1967’s “Soul Sounds” dropped without a trace. So few copies were pressed that 40 years later it is a rare Motown collectible. Despite all this, Clark managed to hang around Motown for quite a while. She co-wrote the Oscar-nominated screenplay to “Lady Sings the Blues,” Motown’s 1972 foray into film. That film, of course, starred Gordy’s ultimate protégée, Diana Ross.